This is good news: it tells us we’re making progress toward a zero-carbon energy system. But it also helps us see the challenges to a full renewable energy transition. 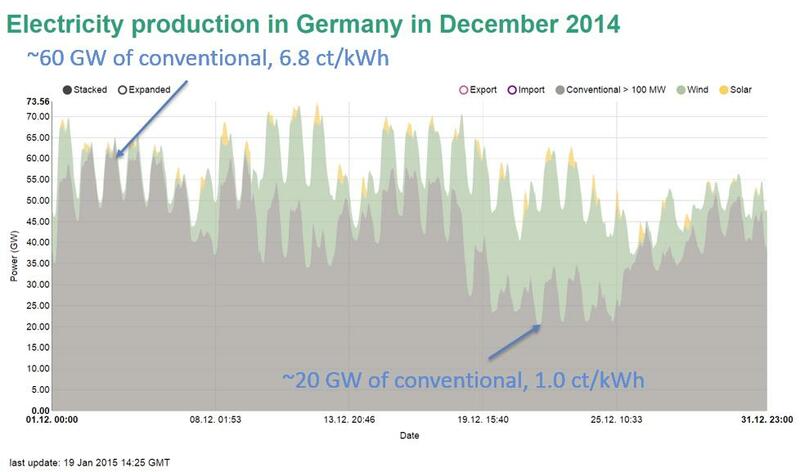 Many press reports said Portugal and Germany were getting all their energy from renewables during these short periods of abundant wind and sunlight. But it’s important to remember that we’re really talking only about electricity, which currently represents about 20 percent of global final energy usage. The other 80 percent of energy usage occurs mostly in transportation, agriculture, industrial processes, and in heating buildings, and currently requires liquid, gaseous, and solid hydrocarbon fuels. We have a big challenge ahead of us in electrifying those areas of energy usage. In Germany on May 15, power prices turned negative several times during the day: utilities were effectively paying consumers to use electricity. This points to the existential crisis that renewables pose for conventional utilities—which, after all, need to sell power to pay for their sunk costs (grid infrastructure and power plants) and for the conventional fuels they still use. What can they do when there’s just too much sun and wind? The sensible response would be to store the energy for later, but that implies still more infrastructure costs. During many days in the year Portugal and Germany face a situation opposite from the one they encountered in May: there is no wind or solar power to speak of. Then conventional coal, gas, or nuclear power plants are still needed—and will be until a time in the future when there is enough storage and redundant capacity in place to buffer the intermittent availability of sun and wind. But getting there will require both investment and a restructuring of the economics of the power industry. As co-author David Fridley and I conclude in our book Our Renewable Future, the renewable energy transition will not consist of a simple process of unplugging coal plants and plugging in solar panels or wind turbines; it will imply changes in how we live, how much energy we use, and when we use it. Historic energy transitions (the harnessing of fire, the advent of agriculture, the fossil fuel revolution) changed societies from the bottom up and from the inside out. There’s no reason to assume the renewable energy revolution will be any less transformative. Richard Heinberg is Senior Fellow-in-Residence of Post Carbon Institute and is widely regarded as one of the world’s foremost educators on the need to transition away from fossil fuels. He is the author of twelve books, including seminal works on society’s sustainability crisis, The Party’s Over: Oil, War & the Fate of Industrial Societies and The End of Growth: Adapting the Our New Economic Reality.